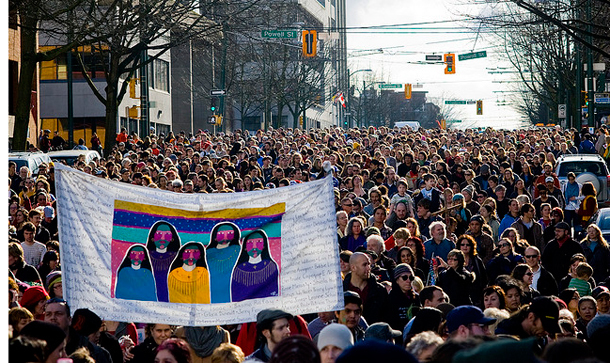 The first women’s memorial march was held in 1991 in response to the murder of a Coast Salish woman on Powell Street in Vancouver. Her name is not spoken today out of respect for the wishes of her family. Out of that sense of hopelessness and anger came an annual march on Valentine's Day to express compassion, community, and caring for all women in Vancouver’s Downtown Eastside, unceded Coast Salish Territories. All these years later, the Women's Memorial March continues to honour the lives of missing and murdered women and all women's lives lost in the Downtown Eastside, and in cities across Canada. My first encounter with the March took place on Valentine's Day 2010 in Victoria. It was a quiet, powerful experience. Indigenous women disproportionately continue to go missing or be murdered in our city. Political will to address these tragedies, or the systemic nature of gendered violence, poverty or racism. In Vancouver the March starts at 12 noon on Sunday, February 14. 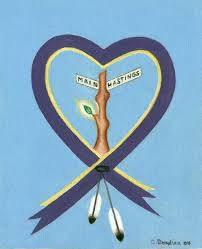 People of all genders are encouraged to congregate at the corner of Hastings and Main at the Carnegie Community Centre. The March will proceed through the Downtown Eastside, stopping to commemorate at places where women were last seen or found. Speeches by community leaders and activists will take place at the Courthouse. Photography is discouraged during the March. No political or union flags, banners, leaflets or posters are allowed at this event. Human Library is an experiential work that began in Denmark 15 years ago when a group of young people created a project to promote dialogue, following a hate crime against a friend. Today there are Human Libraries in 65 countries and thousands of people around the world have engaged in conversation with strangers. Two years ago The Murray Chronicles visited The Human Library at Vancouver's annual PuSh Festival when Sherry was a "book." The Vancouver event has grown significantly since. Located in the Vancouver Public Library's main branch downtown it's attracting more and more "borrowers" every year. Under the thoughtful direction of Dave Deveau and Zee Zee Theatre, Human Library in Vancouver is gaining attention within the community, and the PuSh Festival itself, as a way to connect in ways beyond the capability of our digital devices. These are real conversations with real people. It can be uncomfortable for some, and rewarding for all. Up the escalator to the third level, then to your left ,is where you can check out your "books." And it's at this point you begin to realise that it's all about having a conversation with a stranger, without any filters. It's twenty minutes of getting to learn something about someone you might otherwise never meet, and to breaking down the assumptions that limit your view of the world. It's not so much about the "book" as it is about you: the reader. There are over twenty titles this year, including The Upside of Depression, Life in a Pinball Machine, Single Mom of 3 Boys, Pill-popping, Prostitute, Psychotic…Politician, Letting go of Letting go, and Gay Teen at the Height of AIDS. And Sherry is back too. Human Library runs on weekends through Sunday, February 7th. Like public libraries everywhere, it's free and highly worthwhile. No late fees.